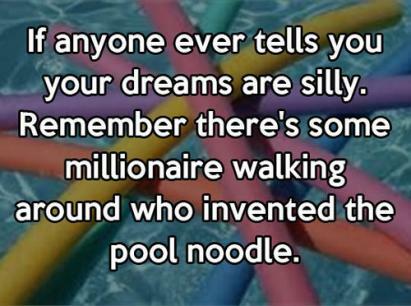 Pool Noodles! Those long sponges that kids float on! I WAS AMAZED AT HOW MANY USES THE POOL NOODLES HAVE AND HOW MANY CRAFTS COULD BE DONE WITH THEM! So why did I create this page and put it on an Animal Website? There are so many uses these Pool Noodles can play in training and Agility Courses and grooming of ANIMALS! I bought my first 20 Pool Noodles to use on my Horse, Equine Agility Course, and I am anxious to get started and to share these Ideas with you. PLUS! : I used to LOVE "Stick Horse" when I was a kid. I would wear them out! Here are some ideas for making your own. Here are ideas easy enough that an Adult and Child could Home Make, Hand Craft, their own Stick Horse...as well as so many other crafts kids can enjoy! 1. Use in the Pool for Resistance Training and Arm Building Exercise. Do this by holding the Pool Noodle parallel to the water and pushing down with both hands into the water. 2. Use as many of few as you like to make a "Car Wash" Horse Agility piece of Equipment, use a FREE Wooden Pallet to hold each side. Train this piece to your equine by setting the two sides further apart when you start them, moving the pieces closer together as you train. You could also start with a couple of Pool Noodle on each side, adding as the Equine becomes acquainted with the piece of Equine Agility Equipment. 3. 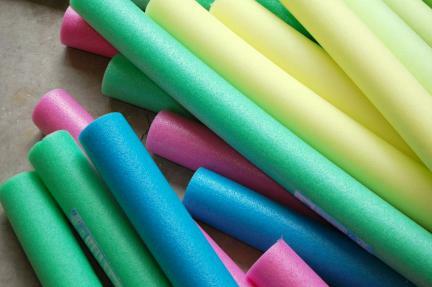 Make Children's Birthday Party Games with Pool Noodles. While There are all sorts of things you could make, a whole "course", start with an easy one. Make a Ring Toss Game, by cutting and making your rings any size, larger for younger children, smaller rings for older children. Make the Toss Sticks, cut out of Pool Noodles, any size you like. 4. Use a Pool Noodle, cut or not, to any size for the basis of a Christmas or other Holiday Wreath. Add a fabric cover to the base, or not. Add your Decor. 5. Hot Glue several Pool Noodles together, in any color scheme you like, and make a Child's Pool Raft. 6. Cut down to size, or leave them long for Pool Play, and stick them in tall boots to keep them upright and looking new. 7. Cut to 1" sections and let a child string them on a rope or cord as a Necklace. 8. Use as is, for a child's game, for two or more children to play a sort of "Field Hockey". Have them move a light weight play ball or a beach ball around in the yard. 9. I am CONVENIENCE a person could build a FULL Agility Course using Pool Noodles as their base item. This could be used for Children, Rabbits or Small Dogs. Yes. A full course. A Full Agility Course. 10. I have seen people cover the collar of Dog Weight Pull Harnesses with Pipe Insulation....a Pool Noodle could also be used. You would have to cut one side open to the middle and set the Harness Collar Webbing within, then close with strong tape or hot glue. 11. Cut 4 pieces of a Pool Noodle down to the size of the 4 sides of a plastic shoe box, or any size storage tub type small box. Glue them onto the side of the tub, use to float snacks, lunch or drinks within....NEVER use glass plates or drink holders, no glass food containers, in a pool setting, especially inside a pool! 12. Use to make a Circle, glue, or tape shut in the shape of a Hoop. Use two for Horse Agility Pause Hoops that are set on the ground for the Human and Horse to each stand in one. 13. On a rainy day cut up a Pool Noodle in to small boats and ship shapes, you and your child make these, complete with sails. When the rain stops, go and sail the new boats in puddles outdoors. Rinse off and use as tub toys. 14. Cut 4, 2" pieces of two different colors of Pool Noodles each....draw a Tic Tac Toe Game Board with chalk on a sidewalk and use the noodle pieces for your game pieces. 15. Use for the Cross Pieces for Jumps for Animal Agility or Children's Games. 16. Use as is, long, as they come, in your hand, as a Desensatising Tool for your Equine. Go slow with this one. 17. Cut a Pool Noodle about 7" long. Use for a Shedding Tool to Groom your Horse, Pony, Mule, Donkey, Equine. 18. Cut a Pool Noodle about 7" long and put tape around it backwards, joining at the seams of the tape. Use for taking pet/horse hair off your clothing. 19. Use to beat a balloon back and forth with a friend....use long or cut to any size you would like to use. 20. Have you seen the photos of the kids playing with Pool Noodles cut and notched like Lincoln Logs? Talk about cute and clever! 21. Cut up a few in different sizes, colors and shapes and use as Tub Toys, or small pool toys, for a young child. 22. Take two, end to end, and put them UNDER a fitted sheet for an edge to keep a child from falling our of a "big kid's bed" when they are first learning to sleep in one. 23. Cut or drill holes into the sides of a Pool Noodle, run a hose into it and let the kids have a blast playing with/in this on a hot day. 24. Of Course, let the kids use the Pool Noodles as Swords! All kids come up with this one on their own. Good for them! Let them play and dream. 25. Make Good Sized Rings out of different colored Pool Noodles then have races with them down stairs, the sidewalk or driveway.....and for those that have to be told....OF COURSE YOU WATCH OUT FOR TRAFFIC! 26. There are instructions on line on how to make chairs, yes, chairs using Pool Noodles for your base item. 27. Make a Mesh Pool Sling Chair using one Pool Noodle, and mess fabric. 28. Cover your Trampoline Springs, for safety, using Pool Noodles that have been cut to size and sliced open on one (long) side. Use all one color or decorate the way you like. 29. Cut a Pool Noodle in half, long ways. Use two sides tilted to race Marbles or Hot Wheel sized Vehicles down. 30. Cut a Pool Noodles to about 8" then cut that piece down, long ways in half, add a bit of dirt, set in a window seal and add seeds. If you add seeds from different plants, you could wait and see which sprouts up first. 31. Use a Pool Noodle for a "Magic Wand" when training animals. Magic Wand? That extension of your arm for cuing your animal. 32. Cut a bunch of Pool Noodles into 2" sections. Using a Glue Gun, make a mat out of the pieces. You could do one color or several. If you are really clever, you could do a Cross Stitch Pattern. 33. Recover an old Lawn Chair Frame with Pool Noodles. 34. Cut several Pool Noodles to approx. 18", or cut each one in half. Glue together, standing them upright, to form a Bench or An Ottoman...foot stool. 35. Use in your "water bottle box", for horse agility rather then the bottles, at least to start. 36. Glue a few together, all but the last end, to make a Horse Agility Jump Hoop (Hoop Jump). The last connection should be "break way" in case the Equine should hit it. Use a small wooden doll, or short piece of tubing to connect the last piece. 37. Do the same as #36, only smaller for other Animals Agility Courses. For Rabbits and Guinea Pigs, as well as Pet Rats, you will need to cut the Pool Noodles down for the correct size. 38. Use connected Pool Noodles to make the area on the ground for a Guinea Pigs Play Area or Agility Course. You might need to build this up with more Noodles (using Hot Glue) for some Cavies. 39. Weave several together for a large fun basket. 40. Make Nap Time More fun for children and pets....build a bed, tall mat, for them to lay on. 42. Make silly hats for you or your kids or your equine. 43. Use at the bottom of a door to stop drafts. 44. Cut into 3" pieces. Using a Permanent Marker, write one letter on each one. 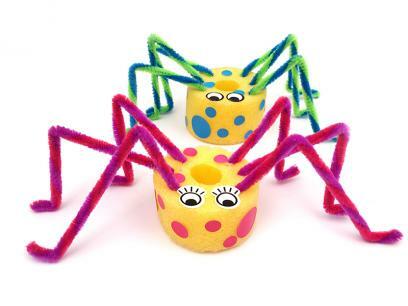 Leave notes for other family member....let kids play with these in the tub, teach the ABC's to a child with these. 45. Use to toss at those you love. 46. Add Lights to the Inside, try the Glow Sticks. 47. Use pieces cut to size for covering sharp furniture edges to protect your self and others. 48. With a Glue Gun and your own measurements, make a Baby/Pet Gate for your home. 50. Make funky clothing.... start with a skirt. 51. Take two Pool Noodles. Cover with a pair of opaque stockings, preferably striped. Add High Heel Shoes to the "toe end" and place the top part under something to make it look like a witch was smashed. Cut for Halloween Decor and or Themed Parties. 52. One of my Favorite Ideas! 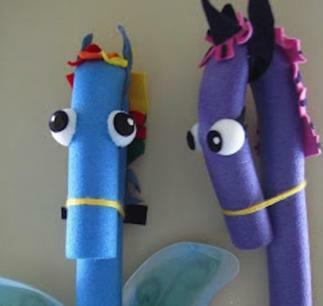 Make a Stick Horse for a small child to have fun and dream on! Give them another for a sword as they ride to "Save The World From Evil!". 53. Make a Winter Sled...use Hot Glue Gun to connect your Sled together. 54. COSTUMES GALORE! Just be creative! 55. Cut up small pieces into different shapes and sizes. Wash up. Use to mark drinks at a party by floating them in drinks with ice. 56. Cover Jump Rope Handles. 57. Use a Noodle, cut to size, then slit long ways, as a door stopper by sliding it onto the door on the long open side. 58. Use to cushion Bucket Handle. 59. Cover skinny Weave Polls for dogs to Weave. Cut down in size and do the same for Rabbits. 60. Make Horse Agility Weave Polls by adding two Noodles together than cutting to size. Slip these over wooden dowels or hose that has been placed into the ground approx. 12' apart. 61. Make rings for your child, or adults, arms. Use these to help keep the person a float in water. Make sure your closures as very secure. 62. Make silly, Suma Wrestler type, pants. Wear them in the pool for fun...everyone needs to laugh! 63. 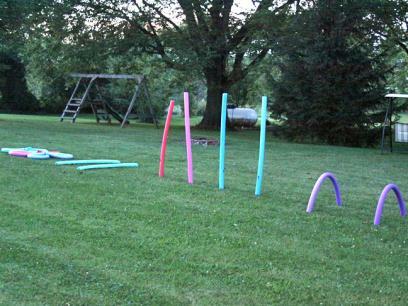 Tilt a couple Pool Noodles and have small marble races through them. 64. Make a Raft and pull the kids or your pets behind you as you paddle a Kayak or small boat. 65. Make a Raft with side, longer and wider than high, to pull your Lunch and Drinks behind you as you paddle a Kayak or Small Boat around the lake. 66. Make your dog a Life Jacket using Pool Noodles and a Glue Gun. 67. Make yourself a Weight Band to add over your Life Jacket for extra Safety when Boating. 68. Cut a Pool Noodle to the size of your bicycle bar, the bar between the seat and the handle bars, then slice the Noodle long ways. Wrap each side, top and bottom over the bar and close with zip ties. This is especially good for boys and young men....just in case anyone would "fall" into that bar. 69. Cut several, as many as you chose, and with a glue gun, make a pillow. The Pillow could be used while watching TV on the Floor, in your Bed, In the Pool. 70. Take 4 Pool Noodles and at the corners join them. Use this for a "Pause Box" in Dog Agility, or Horse Agility, for a Pause Box. 71. Cut different color or the same, approx. 1" sections, and use for Napkin Holders on a Party Table. 72. Cut a Pool Noodle to approx. 13" Use it for a cushioned Music Instrument Recorder case. 73. Cut pieces to about 6" - 9" and let kids use the pieces to dip and blow bubbles with. 74. Teach your equine to fetch a half of a Pool Noodle and bring it to you. 75. Teach your dog to do the same as #74. 76. Decorate a 18" section to look like a Cigar, have your Equine hold it, hanging out of it's mouth longways, as a trick. 77. Make rings with Pool Noodles and teach your equine to put that ring over something like a thick post, for a trick. 78. Cut to any size and use "Mr. Potato Head" pieces to decorate. Fun idea for kids or even a kids party. 79. Make a ring from the size you need for your Equine and make your equine a Silly Hat. 80. Cut small pieces and use sponges for decorating with paint. 81. 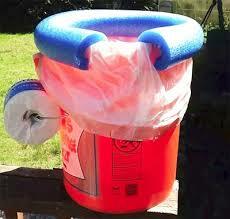 See the Photo....make a Horse Camp Toilet. 82. With two Traffic Cones, stick each end of a Pool Noodle inside the top of each Cone. Use as Markers for Weave Pole Training, Or mark off an area using this as your Fencing. 83. Actually take them to the Pool as is and use for some Water Fun! 85. Use to build a Chicken, Goose/Geese, or Duck Agility Course....yes really. See our other sites at the right menu list. 86. Very carefully, hook one end of a Pool Noodle unto your sink facet, hold on, then use as a hose to fill buckets. 87. I took 1/2 a Pool Noodle, cut it to the size I wanted on my Tackle Box, leaving room for adjustablity in the sling handle. 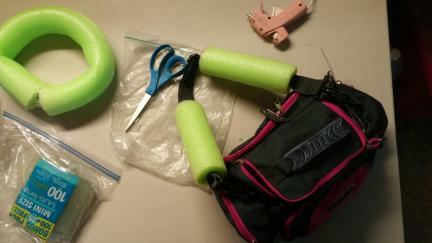 Then, using two pieces I cut the pool noodle long ways, tucked the webbing inside, and hot glued it shut. The little pockets on each end, also now have a short piece of pool noodle inside for a bit more buoyancy should my Tackle Box fall out of the boat! 88. Do the same as number 87 with your Beach Bag. The contents of this page for 101 Uses For Pool Noodles is still under construction. Please check back later.